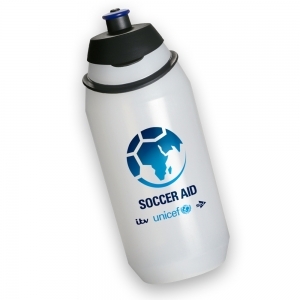 This quality Soccer Aid water bottle is made with 50% recycled plastic. The bottle holds 500ml and is 20cm high. Soccer Aid Productions Limited will receive 20% of the sales price of this purchase. All profits from Soccer Aid Productions Limited are donated to the United Kingdom Committee for UNICEF, a registered charity in England and Wales (1072612) and Scotland (SC043677). Soccer Aid for Unicef is a game like no other. Bringing stars, football legends and all of us together to raise money so that more children around the world can grow up healthy, happy and safe.